Designed in collaboration with Aly, every sock comes with a limited edition, collectible card. These tend to sell out fast, make sure you get them before they are gone! If you need size Large (Women 10+, Men 11+) drop us an email! Aly Raisman is a leader on and off the competition floor. Whether or not you consider yourself a fan of the Olympics, you have definitely heard the buzz about this “Sportswomen of the Year”, three years running. Not only was Aly the most decorated U.S. gymnast at the 2012 London Olympics, but as team captain she lead the U.S. Women’s Gymnastics Team to their first team gold medal since 1996. Her story is truly a dream come true. At just 18 months old, Aly and her mother participated in a local Mommy & Me class where they practiced gymnastics. She even remembers watching the 1996 Women’s Gymnastics Team win gold. Seen through her young eyes, these events inspired Aly to take a path to her very own Olympic Dream. You may have seen (all of) her in ESPN The Magazine’s Body Issue 2015, but Aly prides herself on her fashion sense. Whether sporting a hot pink leotard, while performing a perfect flip on the balance beam, or dancing the tango in fishnets as a finalist on season 16 of ABC’s hit show Dancing With the Stars, Aly Raisman cares about what she wears, which is evident in her own signature leotard line. We are excited to announce the introduction of a line of Aly FEAT socks, made entirely in the U.S., and coming out this Spring. Aly’s physical endurance, abilities and success are a small part of what makes her a worthy Weekender. Not only is she a leader in her sport, she is a strong advocate for positive body image and she inspires confidence in young girls. When Aly is not competing on a world level, she finds herself living the true Weekender lifestyle: writing, and spending time outdoors with friends and family. Make sure to follow her exciting journey, both in and out of the sport. Curious to what music pumps Aly up? 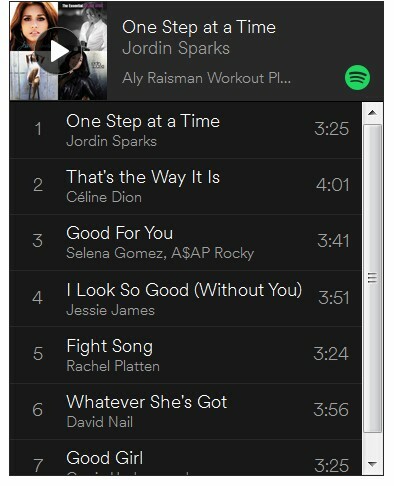 Check out her "Eyes-on-Rio Playlist"